Sedation Dentistry for all ages. Personalized sedation dental care you can trust. Green Bay Smiles provides sedation dentistry in Green Bay, Wisconsin, to help you relax during your appointment and receive your treatments without difficulty. If you experience dental anxiety or fear, we encourage you to contact our office at 920-339-9013 to schedule an appointment with our dentists and discuss the sedation options available to you. Dr. Aaron Bushong and Dr. Beau Schneiss are happy to help you! Many people have questions about sedation dentistry. Our dentists and team at Green Bay Smiles want you to have all the information you need to make decisions about your sedation treatment and your dental procedures. If you have further questions, please contact us at 920-339-9013 to schedule an appointment with Dr. Aaron Bushong and Dr. Beau Schneiss and learn more. If you have anxiety, fear, or a phobia about visiting the dentist, then you are an excellent candidate for sedation dentistry. It is often helpful in allowing you to receive the treatments you need with comfort, and it can help reduce nausea, anxiety, or fear caused by pain, traumatic past experiences, or the sounds and smells of the dental office. You may also require sedation for physical reasons, such as a severe gag reflex or sensitive teeth. No. Sedation dentistry is a conscious treatment, and it is designed to help you achieve a state of deep relaxation. You will be able to breathe on your own, communicate, and respond to any instructions our dentists give, but you will not experience pain or anxiety. In many cases, patients feel as if they slept through their procedure and may not remember the procedure itself. The amount of time you spend sedated depends on the strength of your sedative and how long the procedure takes to complete. Sedation typically lasts 2-6 hours. Depending on the type of sedation you receive, we may recommend that you have someone available to drive you home and to stay with you for a while after your procedure. What does oral sedation involve? Oral sedation involves the use of an oral medication, usually a pill or a liquid, which you take prior to your appointment. This medication helps you relax so that by the time you begin treatment you will feel comfortable and at ease. If you receive oral sedation, you will need to have someone drive you home after your treatment. Yes. We monitor each patient carefully to ensure that you remain safe throughout your procedure. Someone will always be with you during your sedation appointment. Does sedation dentistry have any long-term effects? No. You may feel a little groggy and disoriented after your sedation treatment, but after a few hours, you should feel normal again. You will need someone to drive you home following your appointment, and may want to have someone available to stay with you for a few hours. Any procedure can be performed with sedation dentistry. The sedation treatment is not for the procedure itself, but for the anxiety, stress, or involuntary responses (such as a gag reflex) that accompany your treatment. How many appointments will I need to complete my treatment? With sedation dentistry, you will typically need 2 appointments. 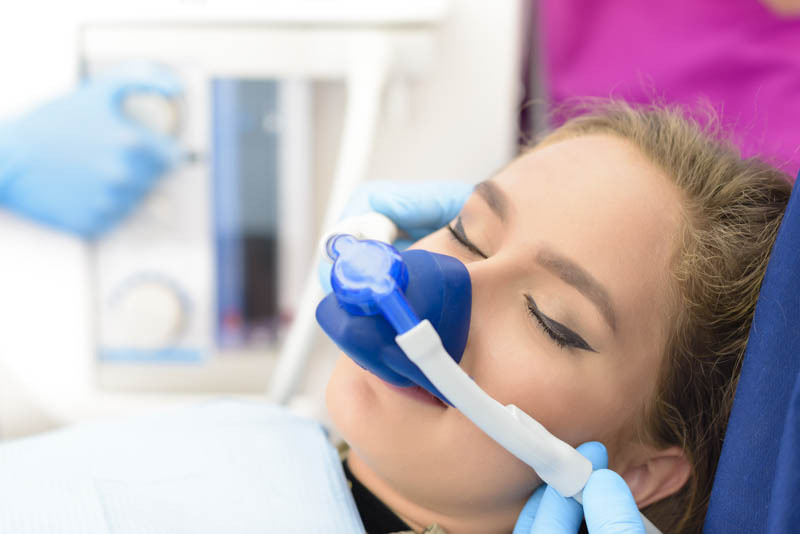 The first appointment will be a sedation consultation in which we review your dental and health history and ensure that you can receive sedation dentistry. The next appointment will be to perform your treatment. Depending on the procedure, you may require a follow-up appointment as well. Most dental insurances do not cover sedation. When you visit our office, we will review your insurance coverages to see if sedation is covered. If it is not covered, we will provide you with a cost estimate and work with you to put together a financing plan.